Which is the Best Portable Solar Generator Kit for You? Solar generators are the latest, greatest thing to happen to generators. They allow you to harness the free, clean energy provided by Mother Nature for your own use! They’re an easy, unobtrusive source of power for camping trips, and they can be a very convenient backup for household power in an outage. We’ve put together this guide to talk you through everything you need to know about solar generators. We’ll show you our Top Three models on the market right now, and go through all the things you need to think about before you buy a solar generator. We love solar generators because they’re clean, quiet, and capture unlimited free energy from the sun. You can run them indoors or outdoors, and use them for all sorts of needs, whether it’s a picnic, camping trip, or power outage. However, where most gas generators are fairly straightforward, solar units are very technical, and require a critical eye. It can be very difficult to tell the gimmicks from the real workhorses. That’s why we put our team to work researching the absolute best solar generators on the market right now! Our most budget-friendly recommendation for a solar generator is actually an expandable solar starter kit. It works as a generator, or as a basis for starting a fixed solar installation on your house. We like it because it provides a high-quality package of gear which can be adapted to suit any number of uses. 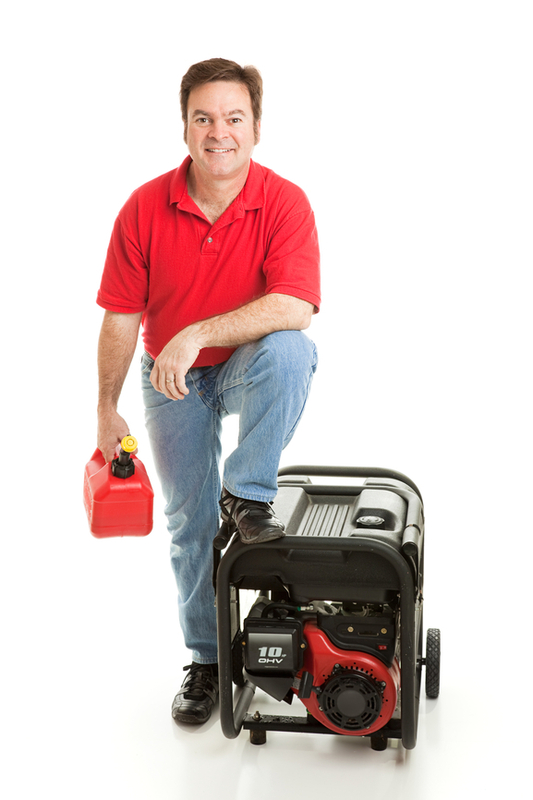 You can use this as a generator for your RV or for backing up your house in an emergency. We think it offers a great set of essentials at a very low price. It also has lots of potential for expansion, which makes it accessible for people who can’t afford the high startup costs of other solar systems. It comes with all the basic parts you need to get started. There’s a solar panel, a charge controller, and all the basic brackets and connections you need to get up and running. It doesn’t come with a dedicated battery, so you can either charge an existing one or buy a new one to use specially for this kit. It’s made to be compatible with RV system batteries, so you can simply wire it to the appliance battery in your camper, or to a backup battery in your home. The solar panel is mono-crystalline instead of amorphous. A lot of newcomers shy away from mono-crystalline panels because they’re more expensive by area. However, they produce a lot more power per panel, and they work much better in overcast or mixed weather conditions. We’re particularly impressed by the Renogy panel, which cranks out a surprising amount of power, even on the cloudy days! At 2X4 feet, it’s easy to pack this one up or fit it on a smaller camper. The controller allows you to get the most out of the panel that’s included in the package. We’re impressed by how many features Renogy have packed into the new Wanderer controller, which is specially designed to be compatible with campers and motor homes. It has a negative grounding system onboard, which helps expand its off-the-grid potential. It also maintains even, controlled flow for all 12V appliances. It’s particularly handy for the 12V-type appliances and pieces of equipment that are standard for campers, trucks, and RV’s. It can be adapted for multiple voltages. The controller allows you to run nearly any 12V appliances from vehicles, or 120V appliances through an inverter. It also works with any type of battery, from marine models to special solar batteries. 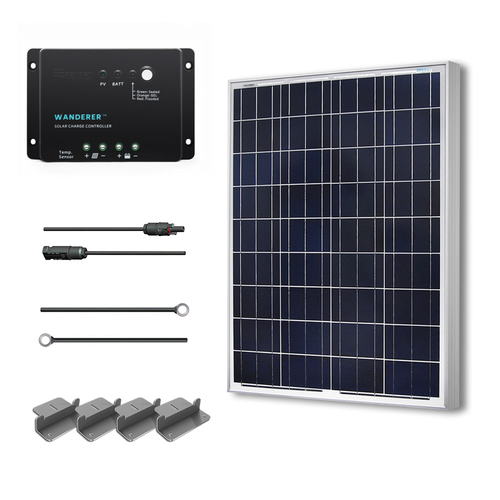 That near-universal compatibility makes this one a great choice for people who have an idiosyncratic system to hook up, or people who want to use solar power for a range of applications. It’s very versatile. This is a kit that’s designed to work in any number of configurations. You can bracket it to the top of a camper, attach it to your roof, or create a portable stand for it to bring on a tenting expedition. You can even use it on your boat! We like it because all the parts are modular, so they’re easy to rearrange. The kit comes with lots of brackets and bolts to help you get set up in any configuration. It’s almost infinitely expandable. You can add solar panels, swap out batteries, and even replace the charge controller as your solar operation expands. So, you could start out using the kit as a backup generator out of the box, and gradually add pieces on until you’re totally off the grid! We’re recommending the “Wanderer” version of this kit, which comes with a 30A controller that can deal with up to 400W. That’s probably enough for most people in a pinch or on the road. However, if you’re buying with an eye to expand in the near future, you might choose one of the upgraded controller options. They’ll allow for systems up to 800W, which is enough to run a household during an outage. Unlike a lot of other solar starter kits, this one’s the real deal. The level of quality in the Renova’s parts is very impressive. This one also has a much better reliability record than other starter sets. The solar panel will be useful for years to come, even if you eventually replace the controller to expand your system. It’s very affordable. You can buy this kit and a nice battery and still end up spending $300 or even less, depending on the charge controller and battery you choose. It doesn’t come with the battery included. This one’s designed to be a build-your-own kit jumping-off point. You can get a good battery for this one starting around $75. There are lots of ways you could set this kit up for a portable generator array, but there’s no portable frame included in the package. You can find lots of plans for easy DIY easels or fold-out frames online, though. Out of the box, it’s easier to use as a fixed RV or home system. Some buyers weren’t impressed by the Wanderer controller. They said they ran into some reliability issues, and eventually replaced it with one of the larger Renova models. We think it’s a good starting point, though. It’s primarily designed for RV and camper use, so you shouldn’t expect the Wanderer model to power a house. If you’re looking for whole-house power, you’ll need to get one of the upgraded controllers (preferably the 800W model) instead of the Wanderer. Where the Renogy Starter Kit offers huge potential for expansion, the Phoenix excels at containment. It’s an all-in-one solar unit with 2 solar panels, a charge controller, and battery in one convenient case. You don’t need any extra supplies or parts to get this one up and running, and you can set it up absolutely anywhere. If you’re looking for the most convenient portable solution out there, this is it! We recommend it for camping trips, and people who want a small, easy home backup system for tech devices and key medical equipment in an outage. It’s extremely portable. 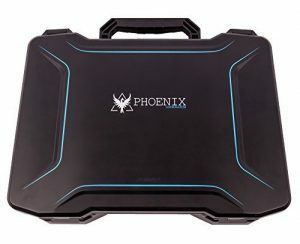 The Phoenix is built around a 3.9″ x 16.1″ x 13.8″ suitcase design, which opens up to two small 10w solar panels. It’s very easy to pack for a camping trip, and it can fit easily with your other supplies in a vehicle. At just over 12 pounds, it’s also very manageable to carry to your site. That portability makes it an excellent choice for people heading to the woods, or people who live off the grid but still need to charge devices like a laptop or phone. It’s very versatile. You can switch easily between AC and DC power output, and there are outlets for both types of power. It supports AC appliances and devices up to 150W. You can run 12V car socket tools, like a tire inflator, or power medical equipment in a pinch. Plus, it’s a universal charging station for tech devices, from laptops to smartphones. We’re sure you’ll find all sorts of use for the Phoenix. Many buyers we heard from used it for camping trips, to charge phones, laptops, radios, and other mobile essentials. It’s also popular among HAM radio operators, since it’s self-contained and can be operated from a vehicle or outpost. Camper-dwellers said it was a very useful tool for getting some creature comforts, like running a fan or a speaker system. And, of course, in an emergency, many buyers used the Phoenix to charge cell phones, radios, and medical equipment. You might not be able to run equipment like CPAPs for a long time on this model (buyers reported about 5 hours on a typical charge), but you can very easily recharge up your CPAP’s backup battery. Folks who tried that said they could do so and still have a ~40% charge left on the Phoenix. It charges quickly. This unit uses micro-crystalline panels, like the Renova Start Kit we’ve already looked at. It can charge fully in about 6-8 hours, depending on sunlight conditions. Under full sunlight, you ought to be able to operate radio equipment and other devices continuously without running into trouble. It works equally well indoors or outdoors, as long as it’s in sunlight. Everything you need is in the box. No exceptions, unless you’re planning to use it with extra panels every time. The Phoenix has the panels, connectors, wiring, plugs, and everything else all in the case. You won’t need any adaptors or extra accessories to use it. There’s also an emergency LED light built in, if you should need to attract attention for help in an emergency. It’s designed for the 21st century. There are 4 ports for charging mobile devices with USB connectors. Inside, the inverter runs on a pure sine wave system, so you never have to worry about damaging delicate and expensive tech gear. Lesser inverters can zap your $500 phone in a heartbeat, so this is a big advantage. A full charge on the Phoenix can charge an iPhone about 30 times. The sine wave system also covers the 1 AC and 2 DC ports, as well as a 12V charger port. Plus, there are LCD readouts on the Phoenix so you always know what’s what. It’s an excellent choice for getting your communications systems up and running in a pinch or in the woods, no matter whether you’re using a HAM radio or a smartphone. Since it’s so portable and tech-friendly, it makes a great travel companion for remote workers who don’t always have a great power source, or for people who want to take a remote work day somewhere charging isn’t practical. You could also bring it abroad as a stable power source in countries where you’d otherwise need converters, surge protectors, and other accessories. You can expand it as you need or want. The dual panels produce 20 watts out of the box, and it’s compatible with additional panels at up to 70 watts each. Adding extra panels means it’ll charge faster, which would allow this unit to power things like medical equipment, which can’t be shut off temporarily. With a few panels attached, you would also be able to run equipment continuously in full-sun conditions. Out of the box, the Phoenix charges to full capacity in about 15 hours, assuming both panels are in sunlight. So, if you want to be prepared for an emergency, just leave it in the sun for a few good afternoons, and you’ll be good to go. Kitted out with a full 100 extra watts, you can cut that charging time down to 2.5 hours. That’s reliant on sunlight, of course! One other option is to charge it from your household outlet, if you don’t have a good spot to leave it charging in the sun for a few days. There’s an A/C-in port which will charge it just like any other battery-powered device. The new version has a great feature we love over the old one. It’s called “MPPT”, or maximum power point tracking. In layman’s terms, it’s essentially a guiding computer which helps you find the best position for the panels to charge, and it’s up to 99% efficient! It’s ideal for folks who are new to solar and don’t always know exactly how to maximize power production. The Phoenix is already equipped to recharge backup systems for medical equipment, but adding extra panels can help it actually run the machines. Of course, that would still depend on weather, so we wouldn’t recommend a unit with this small of a battery for your medical backup. With only the built-in panels, you’re fine to run tech devices as much as you need to (provided you don’t hit a rainy stretch of weather). If that’s all you need to do, you can probably plan to use it as-is. If you’re looking to run larger appliances as well, you’ll probably want some additional panels. Since you’re going through a charge much faster, you likewise want to make your refill periods as short as possible, or ideally get a constant power supply during the brightest times of the day. It’s rugged and secure. The Phoenix is housed in a sturdy case which folds up and locks securely like a suitcase. The housing is rated completely waterproof, and also prevents any dust ingress when you’re not using the system. Our team were overwhelmingly impressed by the quality of the Phoenix. They said that from the intuitive design to the rugged casing, it felt and functioned like a product that had been very well thought out and constructed with care. This newer version also adds the capacity for charging from a 12V car outlet! So, as well as charging from your house in preparation for an emergency, you can fill up as you drive during an outage. It’s not going to power a house, or larger appliances. This unit is primarily designed to charge tech devices, emergency equipment, and smaller medical supplies. It’s better as a portable/small-scale system than as a home backup. On its own, we don’t recommend it for people who need to have larger medical equipment or appliances running continuously. However, with expanded solar panels, it can provide sufficient power to get you through most emergencies. In any case, while you may not be able to use it as a continuous power source for larger loads, you’ll at least be able to recharge backup batteries using this. It’s sensitive to heat, so you’ll want to make sure you don’t leave it in the sun for long periods on hot days unless you’re using it to charge. Most people don’t have any issues, but if you have extra solar panels at a higher wattage, it’s a good precaution to put the battery unit in the shade and run the panels into the sunlight. Our top quality recommendation for a solar generator is this Yeti system from Goal Zero. It’s even more portable than the Firefly, and it can produce twice the wattage in a comparably small package. It’s versatile, expandable, and capable of running some household appliances as well as your tech gadgets. If you’re looking for something that can handle a camping trip or a home outage equally well, this is the one! It’s even more portable than the Firefly. The Yeti comes in two pieces, but taken as a whole, it’s a smaller setup than the Firefly, even though it puts out more power overall. The battery, regulator, and inverter are all housed in a little crate, which has a convenient handle built into the top. The housing contains all your necessary plus and cables. The other part of the unit is the solar panel, which is foldable and very easy to pack away. The Yeti crate unit is a full, all-purpose power station. You can charge it from solar panels, a wall outlet, or your car’s 12V socket. The Firefly, on the other hand, only charges with the solar panels. So, the Yeti is a very capable portable battery system even when there’s no sunlight to work with. We think it’s one of the best portable supplies on the market right now, and paired with a solar panel, it’s pretty unbeatable! The solar panel in this kit, the Nomad, is a 20W folio unit. It folds out to give you a much wider coverage area than its storable size. We like these panels because they’re flexible, and can be spread out pretty much anywhere-from a living room floor to a deck table. It works indoors or outdoors, just like the Firefly. We also love how expandable this unit is. You can daisy-chain multiple Nomad panels together to give yourself a longer continuous runtime during the day, and a faster charge time for using the unit once the sun goes down. As long as you’ve got space for the panels to fold out, you could easily have several going at once. The Yeti can run up to twice the wattage of the Firefly. This one can power appliances up to 300W! You’ll be more than able to run CPAP machines, TVs, and other larger units that the Firefly can’t handle on its own. Previous buyers we heard from said they easily powered everything in their camper, and most essentials during home outages. With that high wattage, this one competes with the Renogy Starter Kit in terms of the appliances it can run. At the same time, it’s a lot easier to move around and modify. It’s as high-tech as the Firefly. This unit has a sine wave inverter, just like the Renogy unit. It has USB ports, 12V sockets, and AC outlets. All of them provide clean, even power which keeps your devices safe. It’s very well-made, just like the Renogy units. We couldn’t find any reports of breakages or malfunctions for this unit. You can easily add on some extended coverage from Square Trade, too. The Yeti unit is not waterproof or water resistant. While previous buyers said that the solar panels handled drizzles without issues, the power unit needs to be kept dry. That makes it a bit less rugged for travel situations than the Firefly. Plus, since it’s not all self-contained, it isn’t quite as convenient to carry. It only works with proprietary accessories. 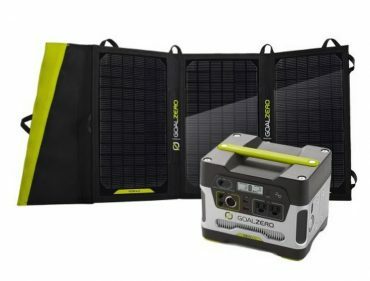 While we don’t have anything to complain about with Goal Zero’s solar panels, some buyers were annoyed to find they couldn’t hook up panels from other brands. It’s quite expensive. This unit costs more than twice as much as the Renogy Starter Kit, and it adds at least one hundred dollars to the price of the Firefly. While we think this makes an excellent starter generator, it might be cost-prohibitive for some buyers-especially if you’re considering adding more solar panels to cover your needs. The Renogy Solar Starter Kit is the best choice for people with campers or RVs to power, since it attaches so easily to rooftops, and has a camper-friendly grounding system. It’s also the best choice for people who want to make a fixed solar panel part of their power supply at home. This one offers the most potential for expansion of our three recommendations, though it’s the most bare-bones on its own. You can swap out any of the components, and expand your installation almost infinitely. Just be aware that a battery will cost extra, and this one’s not as easy to port around as the Firefly or Yeti. The Renogy Phoenix is the best choice for people who want primarily a portable solution. While it’s a bit bulkier than the Yeti, it’s the most self-contained system here, and the most ruggedly built for travel. We think it’s an excellent choice for camping trips, or for a convenient backup for charging essentials during power outages. However, this one can’t handle running appliances continuously, so it’s not our favorite option for home backups. The Goal Zero Yeti 400 is the best balance we’ve seen between convenience and powerful supply we’ve seen in a solar generator. It can power anything from a smartphone to a mini fridge, and it’s very expandable. This one will get you through a power outage safely, even if you have medical equipment like a CPAP that needs a constant supply. It’ll also provide enough power in mobile situations to power a typical flat screen TV, or speaker system. It’s a great choice for people who want something that works equally well at home and on the go! On the downside, it’s the most expensive generator we’ve recommended here, and it’ll cost even more if you decided to add a few extra panels. None of the generators we’ve looked at above are designed to handle big household appliances like a full-size fridge. They’re for charging devices, powering essentials, and getting you through shorter outages. The Renova Starter Kit can eventually be expanded to power a whole house, but it doesn’t come with a battery, which is one of the most important components. If you’re looking for a solar generator that can keep your house running, we’ve got one last recommendation for you. 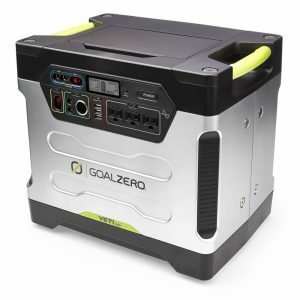 Goal Zero makes a whole lineup of power stations along similar lines to the Yeti we’ve looked at above. This model is essentially a super-sized, super-powered version of the Yeti 400. The Yeti 1250 is a very convenient, portable backup system for your whole house. You can run an average household refrigerator for up to 24 hours on a single charge, and with enough solar panels, operate continuously through an outage. This unit also makes a handy companion for backyard parties or other situations where a large amount of portable power is useful. Like the smaller Yeti unit, the Yeti 1250 can be charged from any power source, be it solar panels, a car socket, or your standard wall outlet. It’s expandable pretty much infinitely, so you can add as many Nomad panels as your space allows for. We think it’s the best choice for people who are going to use a solar generator as their sole source of power in a big outage. It’s also perfect for people who live off the grid, and need something that can handle lights, appliances, and some light tools like a vacuum once in awhile. You’ll need to buy solar panels separately, but the Yeti 1250 makes a great base center for all your power needs. In an outage, it can run a fridge or another larger appliance, as well as keeping all your essentials charged and lights on when needed. It’s an ideal large-scale solution for people who live in apartments, and can’t run a gas generator safely. It’s also the most capable renewable energy backup system we’ve seen so far! These panels are responsible for capturing the sun’s energy, so your generator can store and supply you with electricity. They’re usually a wide, flat surface, with multiple cells marked out on the surface. Some fold along creases, but the solar panels themselves are rigid and can’t be folded up any smaller than designed. Solar panels are generally either amorphous or micro-crystalline. Amorphous panels are cheaper by area, but they produce a lower wattage per inch. Micro-crystalline panels are more expensive by area, while providing a higher wattage for their size. We generally think they’re the smarter investment, provided you can afford them. Solar panels have wattage listed in their names and descriptions. Generator-scale panels usually range from 20-100W. The closer your panel wattage comes to the wattage on your controller and battery, the faster your charging time will be. Remember that many generators allow to to gradually expand your system by linking multiple solar panels. That can drastically quicken charging time, and give you a more reliable output for running appliances continuously. The middle component in your system, and perhaps the most important component of all, is the charge controller. It’s responsible for transferring the energy that comes from the solar panels at a safe, measured rate that will charge the batteries without overheating them or causing internal damage. The controller also deals with the output from your batteries, once power is stored. It adjusts the wattage and voltage of the power that’s leaving your system, catering to your specific device or appliance, and the type of outlet you’re using. The crucial part of the controller for most users is the inverter. An inverter converts electricity from DC (direct current) to AC (alternating current). If you’re using a solar generator for an RV or camper supply, you may be able to get away with a DC-only system, running devices that use a standard 12V car jack. If you’re using any standard household devices, though, you’ll need an inverter which can produce AC power. The best type of inverter to buy is a pure sine wave system. These models produce what’s called “clean” power. That’s a simple way of referring to power that has a constant, reliably-alternating current. Clean power is recommended for most household appliances, and is downright essential for any tech gear like smartphones or laptops. Spikes and fluctuations in “dirty” or irregular power supplies can fry electronics in seconds. Pure sine wave systems cost a bit more, but they’re well-worth the extra investment. Plus, their cost is rapidly becoming more competitive. We can’t stress enough how important it is to get a reliable, durable charge controller. If your controller goes south, you risk damaging anything plugged into your generator, as well as the battery in your system. Spend the extra money to get a quality component up front, and give yourself peace of mind that you’re generating power safely! You can always use a surge protector on the other end, but it’s best to have a controller which does its job properly to begin with. The other really important factor to think about when you’re comparing systems is that while all the components in your solar generator system are replaceable, the charge controller is both the most expensive and the most limiting. It’ll cost more to replace than a panel or a battery, and it dictates how far you’ll be able to expand your system. So, we recommend getting a controller that covers all your needs and leaves you some room to grow, as well. The battery sits at the receiving end of your generator assembly. It’s responsible for storing and supplying captured energy from your solar panels. If you’re buying an all-in-one solar generator, chances are your battery will be built into the casing with the charge controller, and you won’t have much say in which type of battery it is. If you’re building your own system, though, you’ll want to put some thought into which battery you buy. As a general rule, most solar generators will work well with any type of 12V battery, whether it’s a marine-style model or a special solar model. You’ll want to consider where the battery will be stored, and how often you’ll be using it. Most batteries have a stated charge life in the description, so you can get a pretty good idea of how long you battery will last in your application. We recommend making sure that any battery that you’ll be storing inside be fume and gas free, and have some basic overheating protections. Of course, your charge controller should also keep everything stable on the battery end. We also tend to prefer AGM over lead acid type batteries, because they’re safer to dispose of. Solar generators cost anywhere from $300-$2000+. Pricing is relatively straightforward, so you’ll pay more for increased wattage and battery capacity. Essentially, the more powerful the generator, the more it will cost you. You’ll also pay more for efficient and smart designs, like portable generators and foldable solar panels. The more efficient the panel, the more expensive it will be. We generally prefer mono-crystalline solar panels. The cost more than the amorphous options, but they are more efficient overall, and they work better on overcast days. If you’re looking for something basic that will charge mobile devices, communications gear, and smaller appliances, you’ll be set with something in the $300-$500 range. If you’re looking to backup medical equipment, run TVs, or operate larger appliances, you should plan on spending between $500-$750. For a solar generator system that can handle running a larger house refrigerator or other big appliances, we recommend spending $1,000-$1,500. To make sure you get a solar generator system that’ll live up to your expectations, it’s important to nail down exactly what you want your system to do. People use solar generators for a whole range of applications, and there are systems to fit every use. However, you need to make sure you’re getting the right system for your goals. You should keep a tally of the amperage and wattage requirements of any appliances or devices you plan to run using this supply. Many people buy solar generators to help provide electricity to their camper or mobile home while they’re on a road trip. Using a solar generator for electricity saves you fuel, and allows you to enjoy more creature comforts while you’re on the road. A basic solar generator will give you enough power to run a fan, charge your mobile devices, and watch a smaller-sized TV. In this case, we’d recommend a fixed installation on the top of your camper, or a portable generator that you can set up outside during the day. The best option for campers is the fixed rooftop assembly, since you can top up your batteries as you drive. That eliminates any waiting around for the generator to charge once you get to your destination. Fixed installations start around $250, and you’ll want to factor in $100 or so for a good battery, unless you’re going to be using the battery that’s already in your camper. If you’re going on a camping trip, or having a weekend away at a campground, a portable solar generator system is your best bet. In this scenario, you’ll probably want enough power to charge a few mobile devices, power a radio, and have some lights or perhaps a small fan in your tent. You can easily buy a compact suitcase-style generator that’s easy to carry to the campsite, and simply open to get up and running. Your other option is a crate-style system with foldable panels which you can roll out once you get the tents set up. Plan on spending $500 or so for a nice portable system that can handle a camping trip without getting damaged. The most popular application for any generator system is as a backup power supply in the case of an outage or emergency. In this scenario, you’ll use your system to keep a backup supply ready for an outage and use portable solar panels to recharge conveniently as needed. You’ll be keeping your power needs minimal, charging mobile devices, keeping communications equipment like a landline phone powered, and maintaining medical equipment like CPAP machines. A generator system around $500-$750 should be suitable for getting you through a shorter outage, as long as you don’t plan to run any larger appliances like a big TV or full-size refrigerator. Finally, let’s look at a using a solar generator to back up your whole house. As a general rule, most solar generator systems aren’t going to work like a massive propane generator. Unless you run your house on a solar system anyway, you’re going to have to make do without some of your appliances in an outage. However, with a larger generator setup of 1000W or more, you can get through a power outage with perishable food intact, and medical equipment running smoothly. These generators can usually keep a fridge running at least 12 hours on one charge, more if you have a high-efficiency model of refrigerator or a larger panel supply for your generator. For running larger appliances (like a full-size fridge) and medical equipment, we recommend a solar generator of at least 1000W, which will cost you about $1000+ the cost of panels. You’ll want as big a battery as possible, and several solar panels to supply you. Know how much power you need, and how quickly you’ll need it. Remember that in the case of an outage or emergency, it’s much better to have a solar generator that’s already charged and ready to go, so keep your batteries topped up regularly on those sunny days. Likewise, it’s a lot more convenient to get to your campsite with a full power supply already loaded, so plan ahead and be ready for anything!